With great sadness, on August 25th, 2018 RF Safe’s rapidly growing list of political brain tumor deaths potentially linked to wireless radiation exposure grew to include the very honored Senator John McCain who has succumbed to his GBM (Glioblastoma) diagnosis. McCain joins political figures such as Sen. Edward M. Kennedy who died in 2009 from a GBM on Aug 25th, exactly nine years before McCain passed from the same brain tumor type on the same date. Undoubtedly ironic passing from the same disease on the same day. Joseph “Beau” Biden III, son of Joe Biden, the former vice president died from a GBM in 2015. While both Biden and Kennedy used their phone on the same side as their tumors. McCain was always seen using modern phones in his right hand yet his GBM was on the left side of his head. 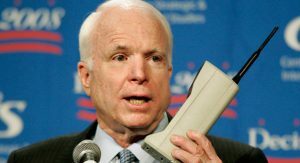 He was left-handed, and one image has surfaced with McCain holding an old school early generation cell phone in his left hand. However, McCain’s cell phone wasn’t his worst microwave exposure, a decade ago the New York Times reported that AT&T and Verizon both installed GSM cellular towers at McCain’s Ranch. Knowing this fact puts McCain’s exposure distinctly in the excessive far-field exposure category studied by the Ramazzini Institute where Biden and Kennedy GBM’s relate to the near-field exposure study published by the NTP. 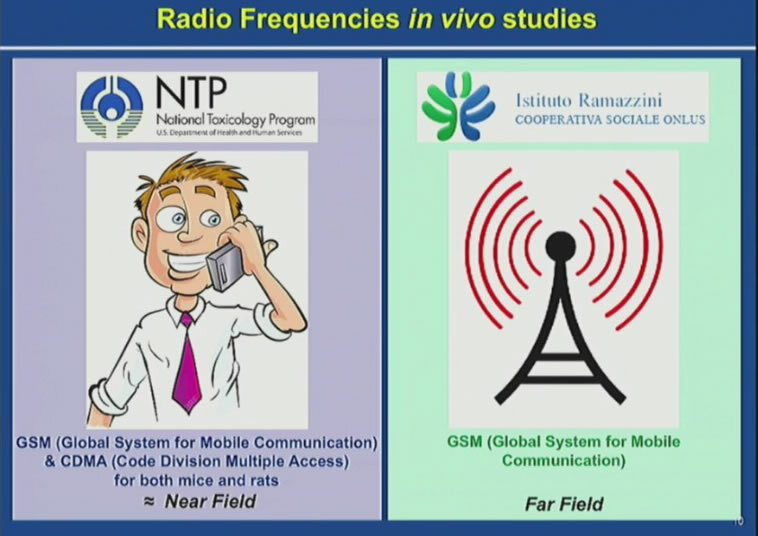 Both studies published in 2018 implicate the Glial and Schwann cells as targets for cell phone radiation exposure. Two of the world’s most substantial rodent studies decades in the making was released in 2018, a near-field exposure experiment performed in the USA by National Toxicology Program and the Italian Ramazzini Far-field study both suggesting that near-field exposure and far-field exposures were attributed to the promotion of this type of almost always fatal brain tumor. In the USA the NTP’s near-field study simulated full body exposure at close proximity to the source of radiation. Near-field is the type of exposure a user gets when the phone is held next to the body, and the tumor from excessive near-field exposure usually is in close proximity to where a cell phone is used next to the body. The Italian Ramazzini Institute’s Far-field study also simulated full body exposure farther from the source of radiation at lower intensities. Far-field is the type of exposure a user gets when living next to a cell phone tower even at an unobstructed line of sight distance, and the tumors from excessive far-field exposure matched the same cell types that were most susceptible to cancer as found by the NTP in their Near-field study. McCain was clearly exposed to excessive far-field radiation via the two cell phone towers on his property — Biden and Kennedy were predominantly exposed to near-field radiation from their cell phones directly. Hence tumor location for excessive far-field radiation can hypothetically be anywhere Glial and Schwann cells are found in the body and less likely to be related to near-field exposure. 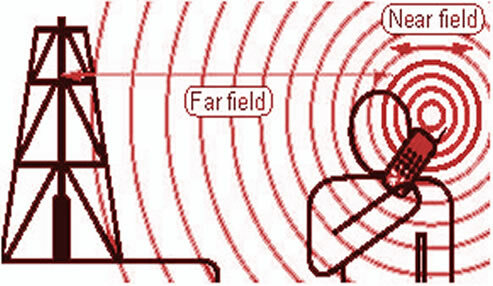 If excessive far-field exposure isn’t present, RF-induced tumors will remain close to the source of RF exposure, ie where the cell phone is used against the body. Jimmy Gonzalez – Gives a stark warning that cell phones do cause GBM (glioblastoma multiforme) tumors! 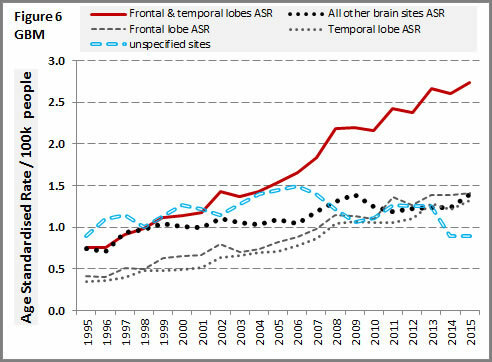 The issue of whether brain tumor rates are static or rising is more complicated than the media or wireless industry would have us believe. It’s true that the overall incidence of brain tumors has not been changing much, but a different picture emerges if one looks, carefully, at what types of brain tumors are rising around the world. The incidence rate for the total group of gliomas increased, with a decrease of anaplastic and unspecified tumors and an increase of glioblastoma. 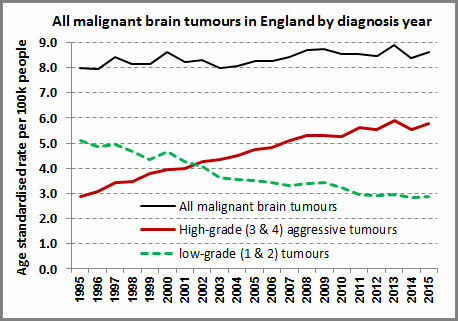 The graph below which shows how the total number of malignant brain tumors (black line) has remained relatively steady, concealing the increase in GBM (red line). The doctors leading the study do not know what is causing the increase in GBM, but they reject improved diagnosis because these tumors are generally fatal and are very rarely missed. “We suggest that widespread environmental or lifestyle factors may be responsible,” they write. One possible factor is the widespread use of cell phones and cell phone towers.